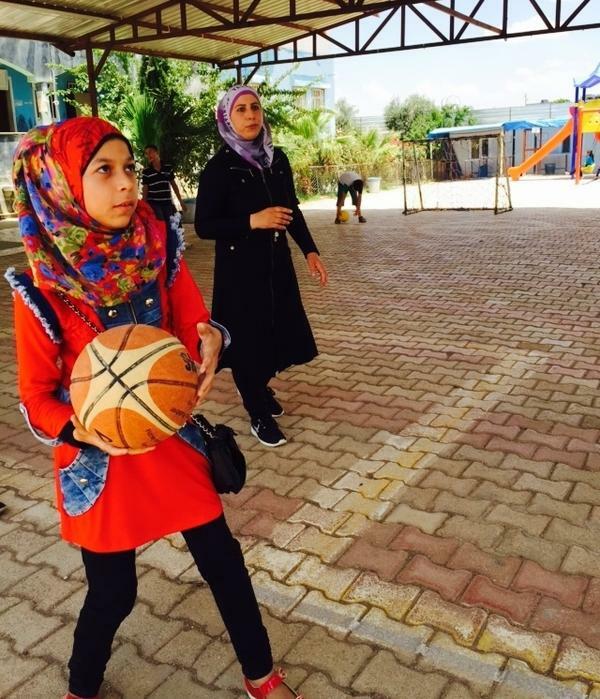 Girls plays basketball at a school for nearly 2,000 Syrian refugees in Reyhanli, in southern Turkey. The schools, which depends on private donations, is struggling to remain open. The students attend in five separate shifts throughout the day. The staff at the Al Salam school in southern Turkey are also Syrian refugees. Maaly Hassan is a secretary and member of executive committee, while Abdul Jabbar al-Hasan is an English teacher and administrative director. 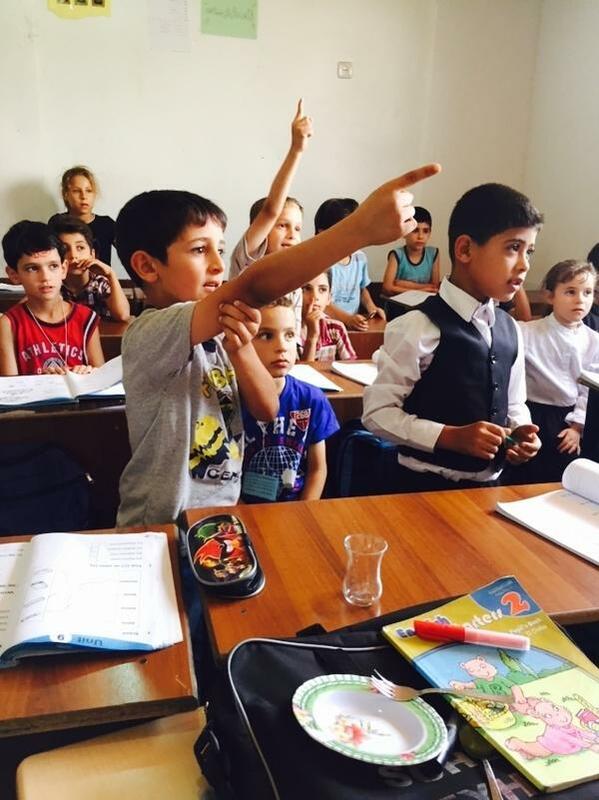 Syrian refugee students in southern Turkey take an English class at the Al Salam school. It opened in 2012 and survives on private donations. A number of others have had to close. 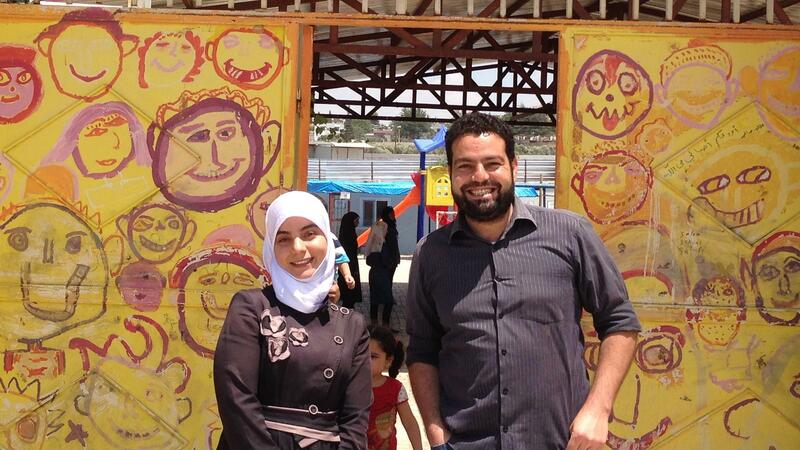 Al Salam School is one of the few success stories in an education disaster for Syria. More than 2.6 million Syrian children have not been in school for three years or more, according to a recent UNICEF report. "We had a lot of students who missed one or two years from their academic years," says Hazar al-Mahayni, the principal and founder of Al Salam. "So we try in summer to give them the chance to pass a full year in three months." Mahayni, a 63-year-old pharmacist from Montreal, opened Al Salam in 2012. Born in Damascus, she moved to Canada with her family 20 years ago. When the Syrian crisis began in 2011, others donated food, clothing and even weapons. But Mahayni insisted that education was the answer. "The future of Syria will come from these children," she says in a Skype connection from Montreal. She tapped into private donors in Canada and the U.S., and partnered with a Canadian school and an American aid group. She now divides her time between Canada and Al Salam's students in Reyhanli. It's 4 a.m. in Montreal, but she's used to operating in two time zones, so she's linked up to the midday conversation taking place in the principal's office in Reyhanli. "I'm with them via Skype when they open and when they close even though I'm not there personally," she says. "They know I will listen and follow up." She's still a full-time pharmacist in Canada, and there are donations to gather. "It's a big number," says Mahayni." Last year the running cost is $50,000 a month." Many private Syrian schools have cropped up along the border to serve the flood of refugee kids, but as the war grinds into a fifth year, private funds have dried up. Out of 19 schools operating in Reyhanli, all but three have closed. Education is highly valued by Syrian families and as schools close down, some parents are willing to risk taking their kids on dangerous routes to Europe, drawn by open classrooms there. Al Salam has expanded to an enrollment of 1,800, but the waiting list has now doubled as other schools close down. To accommodate the demand, the school runs five shifts a day, starting at 6 a.m. Two battered buses navigate Reyhanli each day in a complex round-trip schedule. Mahayni has made hope a part of the curriculum here, a reminder of normal life beyond the tragedies of war. There is a sports program for boys and for girls, a computer lab and mentors to coach older students on how to apply for college scholarships. Even with the support, Al Salam is struggling to keep the classrooms open as the refugee population continues to grow. Most Syrians don't speak Turkish when they arrive, which isolates the refugee community and limits educational opportunities. A report by the Institute of International Education, a U.S.-based education organization, found that only 2 percent of Syrians of university age in Turkey were enrolled in universities. This despite Turkey's policy of waiving university fees and offering scholarships for Syrian students. Mahayni is trying to address the language gap. "As long as we are here in Turkey, our children should learn the Turkish language so that's why we teach Turkish and English from grade one to grade 12," she says. Arabic is taught as well. The Turkish government now administers a 12th-grade exam that is open to Al Salam students and can lead to additional opportunities if they pass. The Karam Foundation, a Chicago-based charity, sponsors technology and entrepreneur workshops and funded a computer lab at Al Salam School. It's changed the future for Sabah Abdulsalam, 17. She left Syria in a hurry three years ago when Syrian security policy threatened to kill her father. "We got out of the country without anything, suddenly," she says. "Without anything, [we] just dress and we leave." Abdulsalam enrolled in the school with her sister and studies computer science. She won the competition for a part-time technology job and now is working on a scholarship for a Turkish university. She says the only way to help rebuild Syria is to study. "I'm not a refugee. It's just a journey and I'll return to my country to build it in the right way," she says. These journeys are the reward for Mahayni, the school's founder and chief fundraiser. She says when the students first arrive they are filled with anger. "They are very frustrated," she says. "If you meet the same students at the end of the year, you will never believe the difference, the change we bring to their lives." One of the many stunning statistics from the war in Syria, more than 2 million children whose families fled that conflict do not have access to schools. That's according to the United Nations. So private donors have been starting private schools to fill this gap. NPR's Deborah Amos went to a school in southern Turkey that teaches English and computer skills and is struggling to stay open. DEBORAH AMOS, BYLINE: When the Al Salam school opened in 2012, teachers and staff expected an enrollment of 300. They were overwhelmed when three times as many kids showed up. And since then, they just keep coming, now 2,000 students who arrive in shifts - five shifts every day, grades one through 12. Instruction is in Arabic, Turkish and English. UNIDENTIFIED TEACHER: Today we will make a review about our last lesson. AMOS: At home, the students live in desperate conditions. But for a few hours each day, there's the familiar world of school. And that's why Al Salam's principal, 63-year-old Hazar Mahayni, raised private money in Canada and the U.S. Born in Damascus, she moved to Canada 20 years ago. And when the Syrian crisis began, as others donated food, clothing, even weapons, Mahayni believed education was the answer. Now she divides her time between Canada and the Al Salam school. When I arrived, I was ushered into the principal's office to meet her on a computer screen, in a Skype call from Montreal. HAZAR MAHAYNI: It's now, let me see what time, 3 o'clock - 4 o'clock in the morning. AMOS: In Canada, she's still a full-time pharmacist. And there's donations to raise. When she's not in Turkey, she's online. MAHAYNI: Everybody in the school knows that I'm always on Skype. They know that I will listen and I will follow up. I just want them to know that there are a lot of people in this world who care about them. AMOS: She's made hope part of the curriculum here, a reminder of normal life beyond the tragedies of war. There's a sports program for boys and for girls, a computer lab and mentors, volunteers who come twice a year for workshops on leadership. Here along the Turkish border, more than a dozen schools for Syrian refugees have closed in the past year when funds ran out. Al Salam remains open with a long waiting list. The school is struggling, but still there's a lot of learning here, including language classes. AHMED GHANOOM: And they are second graders, yeah. AMOS: Teachers and staff are refugees too. Ahmed Ghanoom developed his method of language drills when he taught in a private school in Damascus before the war. GHANOOM: Put your hands up. Oh, oh, what is this? GHANOOM: Oh, is it a spoon? AMOS: They beam when he draws a star in red ink on the foreheads of the best learners. GHANOOM: In this school, we depend on playing if we want to teach these students, especially for the first, second and third graders, yeah. You can get their attention. AMOS: The computer lab grabs the attention of older students. It's changed the future for 17-year-old Sabah Abdul Salam. She left Syria in a hurry three years ago when security police made a threat to kill her father. SABAH ABDUL SALAM: You have to leave the country because you are death. So we get out from the country without anything - just dress, and we leave. AMOS: She arrived in Turkey, studied computer science here, won a competition for a part-time job. And now she's working on a scholarship for college. SALAM: I hope - I was dreaming about getting in medicine to be a surgeon. And I think that I'll make it. AMOS: You think you'll make it. SALAM: Yes, I will make it. I will fight for this. AMOS: Education is highly valued by Syrians. And Al Salam's principal has a warning. As schools close down here, parents will risk taking their kids on dangerous routes to Europe, drawn by open classrooms and a future. Deborah Amos, NPR News in Reyhanli, in southern Turkey. Transcript provided by NPR, Copyright NPR.